Last November I temporarily stopped showing photographs from my September trip through parts of the American Southwest so that you could see some of the many things going on in nature in Austin during a colorful late-autumn. Now let me reach back and show some more pictures from my trip. Mixed in with those images are likely to be a few more-recent ones from Austin. In a November 9th post that showed petroglyphs in New Mexico and Arizona, the second photograph also let a four-wing saltbush plant creep in at the lower right. 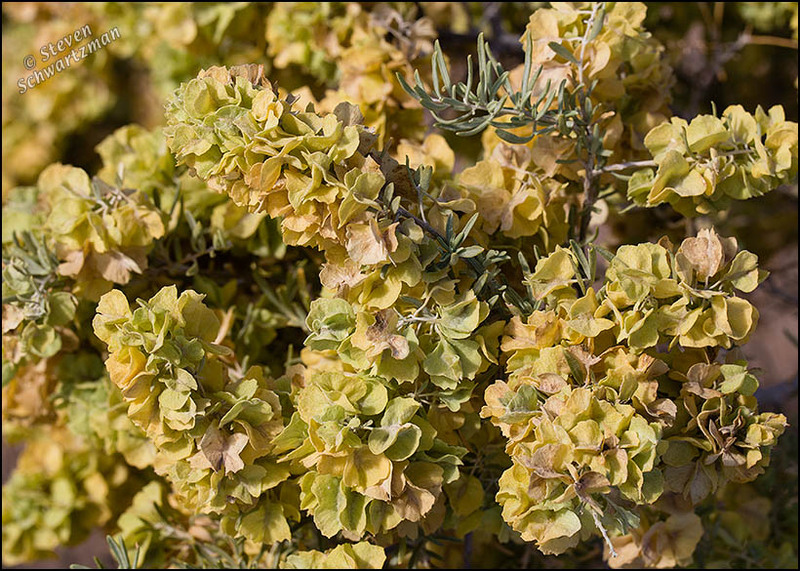 Melissablue said she was “tickled that we are still treated to botany.” At the time, Atriplex canescens was only “a member of the supporting cast,” as shoreacres put it, but now four-wing saltbush gets to play the starring role. The in-situ picture above and the closeup below of another specimen are from two sections of Petroglyph National Monument in Albuquerque on September 23, 2014. Pretty, useful and tasty. What more could you want? That’s a good tripartite summary of a four-winged bush. Obviously I need a fourth quality to keep things equal. It takes only a 25% reduction to get from 4 to 3, but it takes a 33-and-a-third % increase to get from 3 to 4. Reality can seem (or be) unfair. Now that is unfair, especially to those of us who struggle with maths. Has kind of a Euphorbia look to it, doesn’t it? Useful and tasty… I think I missed that part. In the “To B or not to B” category, Euphorbia can cause euphoria in plant lovers. A quick glance at the first image, while still in the email notice, had me thinking of a goldenrod thicket. Just shows how important it is to look closer or even stop and smell the saltbush. The many blooms are really quite lovely. I wouldn’t have thought about goldenrod, but now that you mention it I can see some resemblance. Your “stop and smell the saltbush” has an alliterative advantage over the conventional phrase. Steve, note my reply to shoreacres below. No kind of saltbush grows in Austin, nor had I ever heard of these plants, so the one that I encountered 700 miles away in New Mexico was new to me. I also didn’t realize until your comment that saltbushes grow in even more distant places. According to Wikipedia: “Atriplex is distributed nearly worldwide from subtropical to temperate and to subarctic regions. Most species rich are Australia, North America, South America and Eurasia. Many species are halophytes and are adapted to dry environments with salty soils.” I was just a visitor in saltbush habitat, but you have years of experience with these plants, which I’m glad to have reminded you of. Such lovely, muted colors in the flowers. The combination of yellow and green is beautiful. They look so much like already-dried bouquets. Perhaps the presence of the beige petals is a sign they had begun drying. I like the grey-green leaves and stems, too: so much like cenizo, sand sagebrush, or even mealy blue sage. 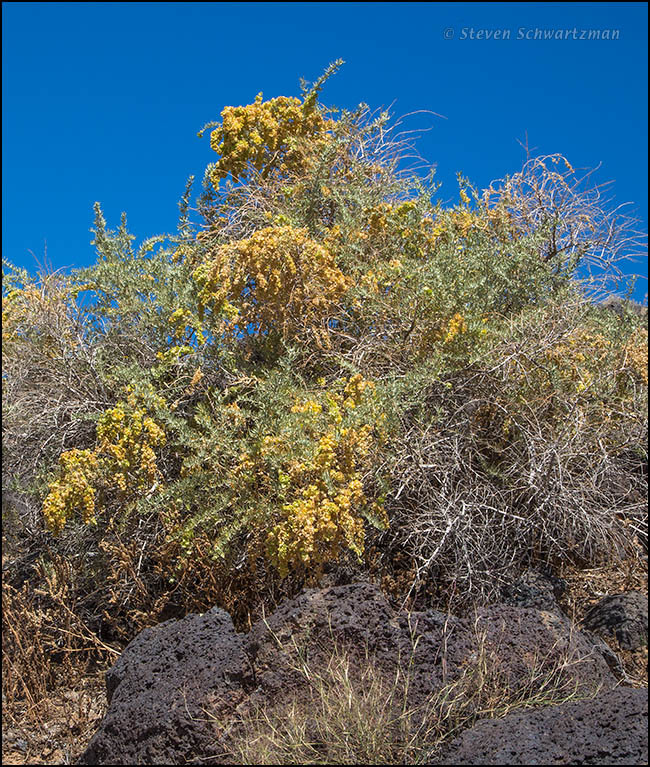 One curious thing I learned from the article is that “fourwing saltbush can exhibit trioecy (three sexual states), with plants able to switch from female to male under environmental stress.” Just imagine if people could do the same. Interesting plant, the blooms are really special. Charlie, check out my reply to the comment right before yours.